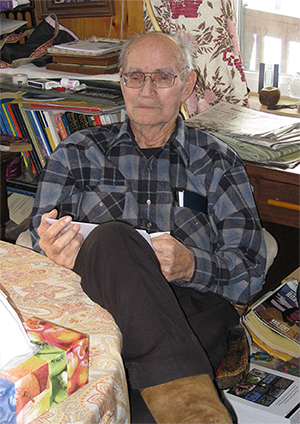 Sidney Charles Huntington (1915-2015) was born in Hughes, Alaska. His Koyukon Athabascan mother Anna once walked from Nome back to her family on the Hogatza River alone in mid-winter, a journey of over 400 miles. In 1897, his father came to Alaska from New York looking for gold. When Sidney was five years old, his mother died suddenly leaving Sidney and two younger siblings to survive on their own in the wilderness for two weeks. That experience gave him a spirit of self-reliance that he instilled in his own 20 children and in countless other young people he mentored over the years. Although his formal education ended in the third grade, he never stopped learning and figuring out how to do things on his own. He was a trapper, miner, fisherman, business owner, member of the State Board of Game, civic leader, and advocate for his people. Sidney spent his last years with his wife, Angela, at the Yukon-Koyukuk Elder Assisted Living Facility on the banks of the Yukon River in Galena, Alaska. Sidney celebrated his 100th birthday on May 10, 2015, surrounded by family and friends. He passed away on Tuesday, December 8, 2015. 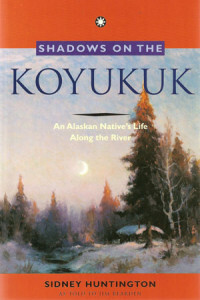 Sidney’s book Shadows On the Koyukuk as told to Jim Rearden is a compelling story about the hardships and rewards of growing up in a traditional Alaskan lifestyle 100 years ago. During the September 2014 Yukon-Koyukuk Tour, Sidney Huntington traveled downriver from Galena to attend a performance of The Winter Bear in Nulato. Before the show, Mr. Huntington shared intimate details of his own painful experiences with suicide.